Wooden Maple Leaves Trivet and Coasters Gift Set is Made in the USA! Looking for something unique? Solace is a line of wooden home decorative items. By laser cutting them, we can offer extremely intricate designs. The patterns developed to date have been carried into a variety of complementing products. 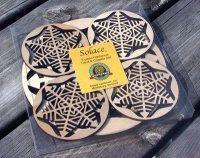 Although they are highly decorative, Solace coasters, boxes, trivets, and holders are all very functional as well. Gift set of four coasters and one trivet. Laser cut from hard wood. Natural maple color with clear finish. Coasters measure 3-3/4" diameter, 1/4" thick. Trivet measures 7-3/4" diameter, 3/8" thick. Packaged in clear plastic box. Maple Landmark crafts a wide range of wooden toys, games, and gifts made in Vermont, USA. They follow American standards of product safety, employee safety, and environmental protection. All Maple Landmark products come with a guarantee. Maple Landmark is a family owned and operated business.